I have been raving about this loaf for the past few weeks. Well more like banging on about it. I don't think there are any of my friends and family left that have not heard about this amazingly fantabulous loaf. 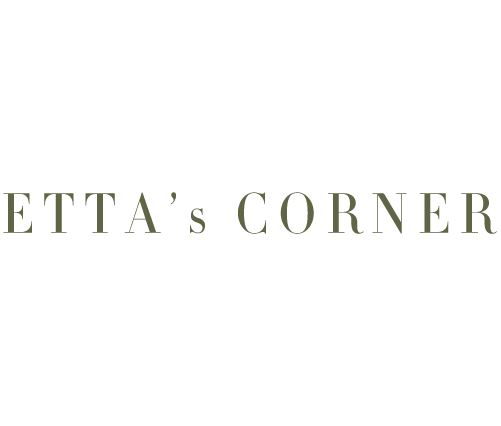 Yup, Mat's been praising it like mad as well, so everyone's heard this at least twice. If any of you have set yourself the challenge and New Year's resolution of baking your own bread and failed miserably because you just can't face the whole kneading and proofing business, this is the bread for you. It's not dense and full on like other "quick-fix" breads (this one I made was one such bread which I loved but others found a bit too hard to handle), it's moist and fluffy on the inside and has a beautiful crust. 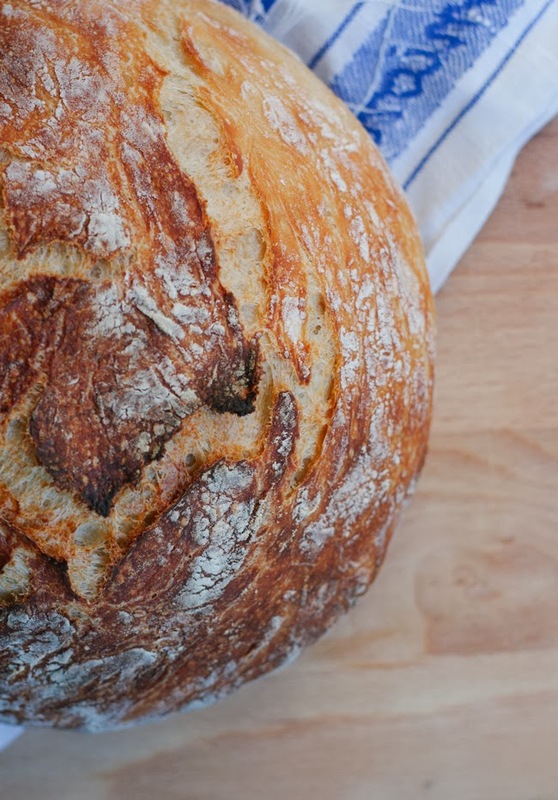 There are hardly any ingredients and in comparison to the £1.50 you would usually spend on a shop bought loaf (or lots more on organic loafs from your local bakery) this bread will only cost you pennies. 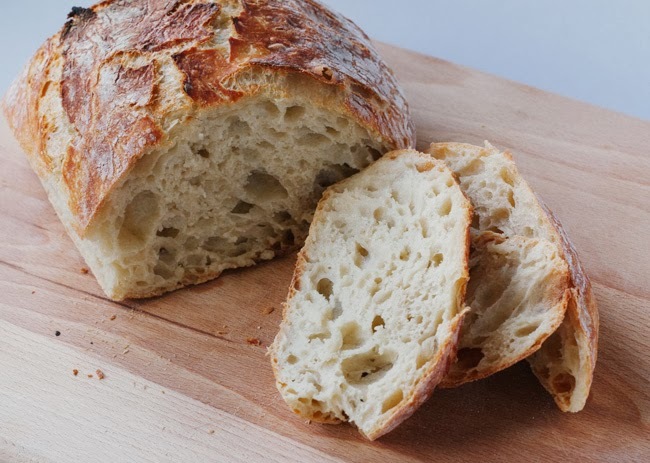 Using white flour gives you an airy consistency with a thin, crispy crust, similar to the bread you get at your favourite Italian, whereas using wholemeal flour will create a slightly denser, more substantial dough with more bite and stronger flavours, similar to an Irish soda bread (without the soda flavour). You must try this! I am also planning to experiment with gluten free flour as well as using a sourdough starter instead of yeast. Let's see where that takes me. I will most certainly share the results. 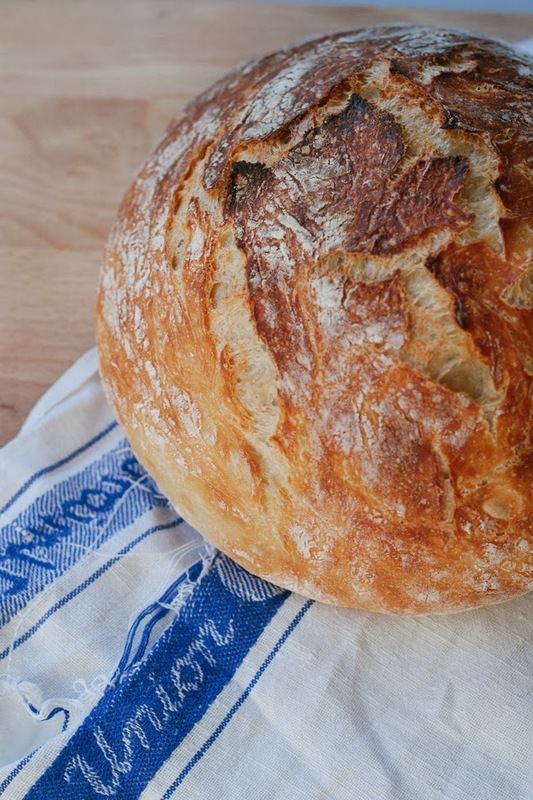 Thanks to James at Bleubird Blog for posting this recipe in her Weekly Bread series. In a large bowl mix together the dry ingredients. Add the water and roughly combine everything with a wooden spoon until the mix resembles a dough. Cover the bowl with cling film and a clean kitchen towel and place in a warm-ish place for 12-18 hours but don't worry if it rests longer. You can mix it in the evening and then bake it the next morning or even leave it until you come back from work in the evening. Heavily flour a clean work surface (I mean a very generous handful of flour). Place your dough in the middle of the surface and form a ball by tucking the dough under itself. Make sure your dough is covered in flour. If it sticks to the surface add a little more flour. Cover the dough with cling film and leave to rest for 30 minutes. Pre-heat the oven to 450˚F (230˚C) and place a good size cast iron pot in it to heat up. If, like us, you don't own one of these beauties a large stainless steel pot with a lid or even an enamel pot will do the job beautifully. 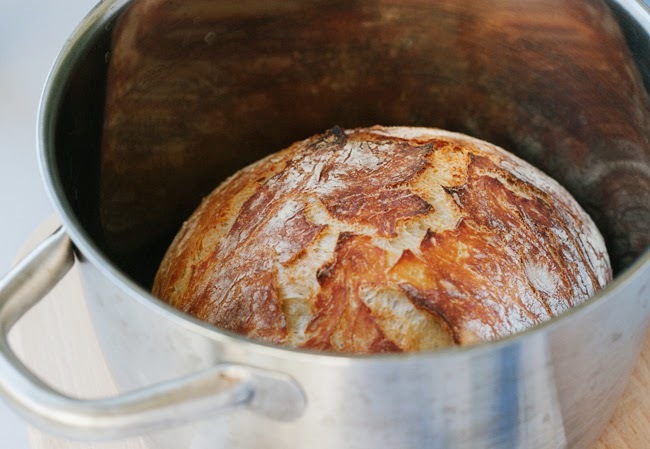 Once your bread has rested for 30 minutes, take out the hot pot from the oven and carefully place the bread into it. 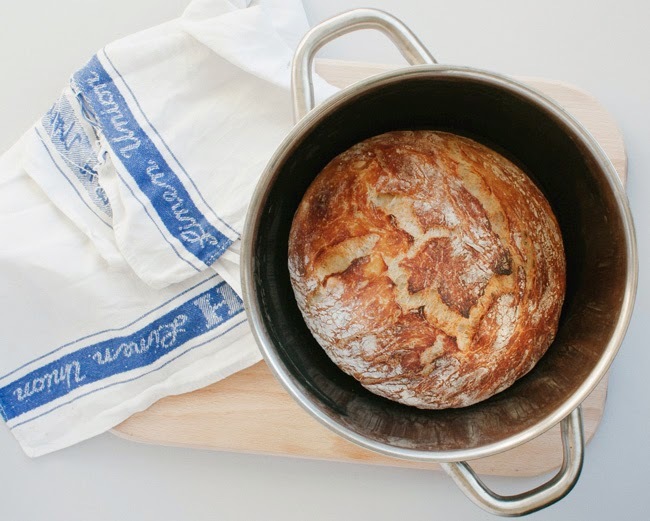 You don't need to grease the pot, the bread won't stick and will come out no problem at all. Put the lid on the pot and place the bread in the hot oven. Bake for 30 minutes. After 30 minutes take the lid off and bake the bread for a further 15 minutes. Depending on your oven your bread might need a little more or less. Have a look at the crust if it's a beautiful golden brown and not too springy to the touch it should be done. 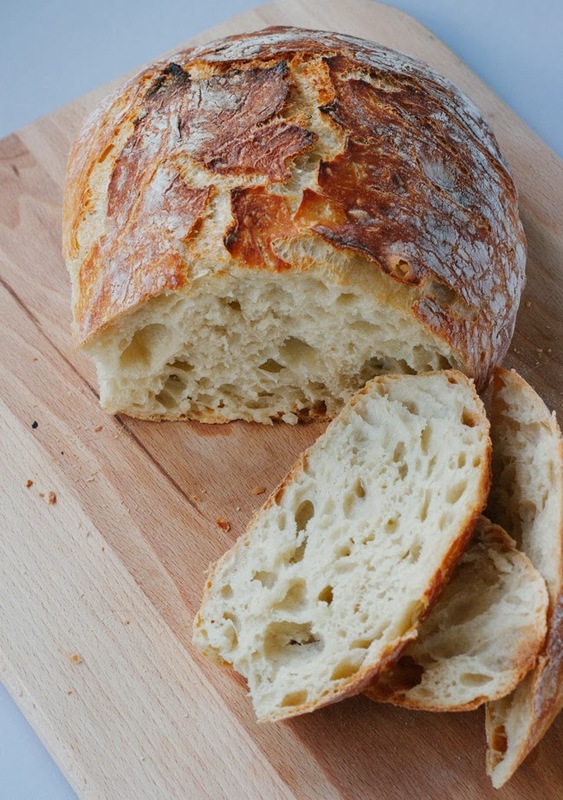 Take the bread out of the oven and leave to rest on a cooling rack or just cut into it, smother in butter and devour! Wow, this recipe sounds great (and looks good too)!